The 800 RMK Assault 155 is a backcountry mountain snowmobile built for extreme conditions. The tough-as-nails sled, featuring Walker Evans Needle Shocks, is perfect for dominating cliffs and jumps. LIGHTWEIGHT: Polaris snowmobiles are the lightest sleds on the mountain. Polaris®mountain sleds have always been light AND rigid with added strength & durability while reducing weight on the RMK® AXYS® platform. Polaris uses design optimization software to analyze the loads and stress points for various systems and components of the snowmobile which allows the team to design lightweight yet durable snowmobiles. Providing riders with instantaneous lift, Polaris sleds help riders get up on top of the snow faster. POWDERTRAC™ RUNNING BOARDS: The PowderTrac™ running boards have been developed for maximum snow clean out and maximum strength. Built from extruded aluminum with bonded cast lugs, they boast an open area of over 50% and integrated traction that is machined in for sure footed performance. There is now additional open space at the back of the boards by the rear pad to reduce snow build up. 800 CLEANFIRE® H.O. ENGINE: Developed in conjunction with the AXYS platform, the proven 800 Cleanfire® H.O. Engine delivers class-leading acceleration. The integrated mounting position optimizes the balance of the chassis. 3-stage electronically-controlled exhaust valves. Electronic oil pump. Thermostat with bypass warms up to operating temperature 40% faster and improves durability. High-efficiency intake and exhaust. VForce Reeds. Lightweight crankshaft. Throttle body is lighter weight and reduces throttle effort. Grooved Piston. ASSAULT TRACK OPTIONS: Assault riders have a choice between the Peak 2.25" and the Series 6 2.6" track. The Polaris exclusive Peak 2.25" track is the ideal track for mixed hard pack and deep snow conditions providing impressive traction and control. The single-ply design features a stiffer lug base with flexible tips to provide a hybrid of speed and flotation. The Polaris® exclusive Series 6 2.6" track provides the ultimate all mountain performance. The new lightweight track is designed for improved deep snow and hard pack traction and better lift. CHAINCASE DRIVE SYSTEM: The Assault uses Polaris' tried and true chaincase drive system, which delivers the perfect combination of strength and performance for cornice drops, jumps, and attacking any terrain. 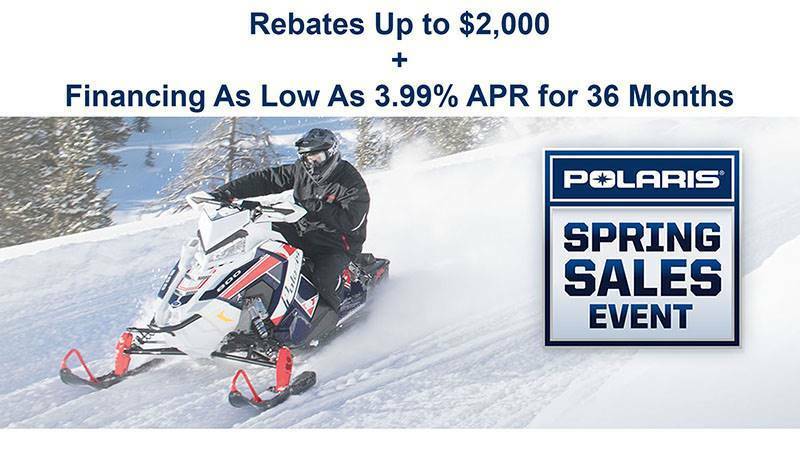 MESSAGECENTER DISPLAY: Exclusively from Polaris - the most advanced instrumentation in snowmobiling. This 4.3" high resolution, full color, LCD digital display provides a rider with information. Sled performance: Speedometer, tachometer, dual tripmeters, average speed, max speed, engine/trip hours & odometer Sled operating conditions: Coolant temperature, diagnostics & maintenance warnings. Riding conditions: Air temperature, time of day in 12 or 24-hour clock format. Bluetooth™ functionality: Enables the gauge to communicate with the rider’s cell phone and provide notification of incoming calls or texts. Displays phone battery & signal strength. GPS/Mapping Capability: A compass is standard, & full-featured GPS can be installed to provide directions & information about services such as fuel, restaurants, lodging & Polaris dealerships. Customize the GPS to operate with North Up or Course Up navigation depending on your preference. Ride Planning Feature enables you to plan a ride using Ride Command, save it as a GPX file, and transfer it to the display through the USB interface. This gauge comes as an option on some models, and is available as an accessory option. COMPETITION-SPEC FRONT END: Wide and adjustable, this RMK® Assault® can be dialed for your exact needs. AXYS® ASSAULT®ADJUST: The RMK Assault features the AXYS™ Assault® Adjustable front suspension to provide riders adjustability and performance for extreme backcountry mountain conditions. Peak - 155 x 15 x 2.25 in. Series 6 - 155 x 15 x 2.6 in.